and nutritiously healthy dog food at home. Food that you prepare for your Maltese pup should be both tasty and healthy. Another important point is to remember all the ingredients that should NOT be added to your dog's food. A few ingredients that are unhealthy and can be fatal to your Maltese include citrus oil, mushrooms, and avocados. A complete list (over 60!) of these dangerous foods can be found in this home cooked dog food guide. Do not feed your dog what you are eating, as most human food includes some of these ingredients. Ideally, a dog's diet should be composed of 30% starch (some people argue that this can be left out entirely though), 30% vegetables and 40% protein. These are the major food groups that you should choose from when making your own dog food. Share your tips, experiences, and thoughts about homemade dog food. Maltese dogs are small in size and have a very friendly personality. This makes it easier for dog owners to take care of them. However, being so small and fragile, these dogs need special attention. They also tend to be picky eaters, so finding their favorite flavor combinations is a must. There are specific nutritional needs for all dogs to stay healthy. If they fail to receive all the nutrition they require, they will end up developing a variety of diseases and problems. Therefore, if you are making dog food for your Maltese, you must ensure that it is a balanced diet. 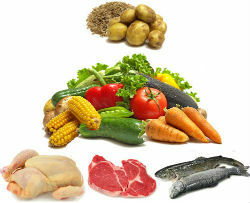 All living things (including dogs) require minerals, vitamins, carbohydrates, fat, protein and water to be healthy. So, the key to prepare a healthy diet is to balance these essential elements. All Maltese dogs are different and have their own specific nutritional requirements depending on their chemistry structure, activity level, and metabolism. This is why it is greatly recommended that you consult with your vet before you try any homemade dog food recipe. Use organic and natural ingredients to make healthy homemade dog food recipes for your pet. Preservatives and additives can be troublesome for Maltese dogs. A healthy pup requires a good percentage of protein in their food, use venison, fish, rabbit, lamb, chicken or beef. A combination of fat and high protein (which can also be provided as a fatty-acid supplement) is a great way to maintain a healthy coat for your Maltese. There is some debate about whether carbohydrates are really needed in the diet of a Maltese dog. Some people add them, but it is not required. Good sources of carbohydrates include wheat, rice, soybeans and corn. Minerals and vitamins are also a vital component for the diet of your dog. Quality vitamins can be purchased from a vet office or store. You can easily add these vitamins in home cooked dog food. If you're considering a home cooked dog food diet for your Maltese I highly recommend this comprehensive dog feeding guide - Dog Food Secrets. You'll learn all about the complete nutritional requirements of your dog, foods you should avoid, plus tons of wholesome and healthy dog food recipes that your Maltese will love! When you prepare your dog's food yourself, you know what is inside. Is it possible for you to identify the ingredients and nutritional value of a brownish nugget packed in a box? Recent dog food recalls have made it even more essential to really check what's in the food you feed your dog. When you make your own dog food, you can keep check on both the ingredients and the amount of nutrition present in the food. You know your dog better than dog food manufacturers. You are well aware of the likes, dislikes and personal specifications of your dogs. This makes it easier for you to give your dog what is actually required to stay healthy. You know best and thus you can choose the correct food for your Maltese. The right food choice can help eliminate various behavioral and physical problems and can result in a healthier dog. Tear-staining (a common problem in Maltese), can also be reduced by a good diet and it further helps in keeping the energy level of your dog up and prevent lethargy. If you succeed in preparing the right diet for your Maltese puppy, you can ensure stronger bones and proper growth for your dog. When you make your own dog food, you make sure that your dog is eating food that not only comes up to your standards, but is also free of chemicals, fillers and artificial preservatives that are common in commercially prepared dog foods. On the other hand, the cons of trying a homemade dog food recipe are more general. You will be required to spend both time and effort to prepare home cooked dog food for your Maltese. But the actual sight of an older dog playing and appearing as a little puppy will be absolutely enchanting and worth it. 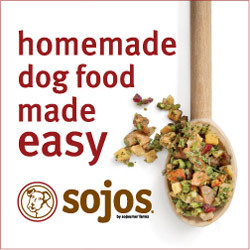 Of course if you want the benefit of healthy home cooked dog food even if you don't have much time to spare, you can still do it with a little help from Sojos. See how they make homemade pet food easier to do. Dog foods available in stores are not always healthy and safe. So in order to be on the safer side, try out homemade dog food recipes. If you are cooking lean beef or turkey in a skillet, make sure you cook it till it's completely brown and no red meat is visible. It is always wise to get your dog checked by a vet before you switch to homemade food for your dog. You may even consider some tests that show any deficiency your Maltese is facing, so that you prepare food accordingly. Once you know what is needed, there are a variety of supplements available that you can easily add to your dog's homemade food. Always buy good quality meat for your dog if you really want to prepare a healthy and balanced diet. Most of the commercial dog food uses meat that is unfit for humans, which makes them dangerous for the health of your dog as well. A mixture of carrot, rice and ground turkey is well liked by most Maltese dogs. Meals made of carrots, brewer's yeast, brown rice and ground beef are also great for picky eaters. Do not forget to provide your dog with a variety of foods and nutrients by rotating the food regularly. It is not required, but you can also add potatoes, rice, pasta, and oatmeal. Do not refrigerate homemade dog food for more than 3 days. You can freeze meal-sized portions for up to 6 months in an airtight container. Need more help creating the perfect meal for your little Maltese? Learn more about making the most healthy homemade dog food here. Fry ground meat until it is completely browned. Add rice and stir to mix well. Add the 3 cups of the broth and bring to a boil. Simmer for five minutes. Add all veggies and remaining broth. Simmer for another 20 minutes, or until broth is completely absorbed. Stir in any dog vitamins (if desired) and let cool. Immediately serve, or freeze this dish in individual portion sizes for up to 3 months for later use. See more homemade dog food recipes Maltese dog lovers recommend. Tell other Maltese dog lovers all about how you make your own dog food. Does it take a lot of time and planning? What recipes or products do you recommend and why? Please include pictures of the yummy food too! 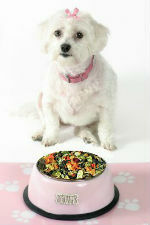 Looking for even more healthy homemade dog food recipes for Maltese? Check out these tips and recipes recommended by Maltese dog lovers.